In the search for the rare, elusive and/or beautiful it is easy to take the common, familiar and beautiful for granted. This is especially true when something has been used as an advertising icon and an egregious example of this is the Eastern Rosella, used as an icon in Australia for Rosella tomato sauce, soup and chutney, first image. No doubt the brilliant red head and breast of the Eastern Rosella played a part in its selection, but the Rosella company is a bit coy on the subject and mentions that Rose and Ella were the daughters of the original owners when in 1895 they bought the trademark from the makers of a eucalyptus oil cure for rheumatism. to reach the seed heads. The first photo shows the splendid male on the fence wire and the second photo shows the same bird on the grass. Rosellas are a bit shy usually keep their distance unless they have become used to people and I’ve had difficulty in photographing them, but this pair was fairly obliging. The specific name eximius is Latin for ‘extraordinary, excellent, fine, superb’ so George Shaw, not George Bernard but keeper of the British Museum, was clearly impressed when he named it carefully in 1792. It takes Mother Nature to combine vivid primary colours without appearing garish, and I particularly like the luscious apple green of the rump, seen better in the second photo, an excellent field mark when you spot the birds flying away, as is often the case. The females are beautiful too, though not quite as bright as the males and the third photo shows the female of the pair walking along the top of the fence and the red colour of the head suffused with greenish-brown. 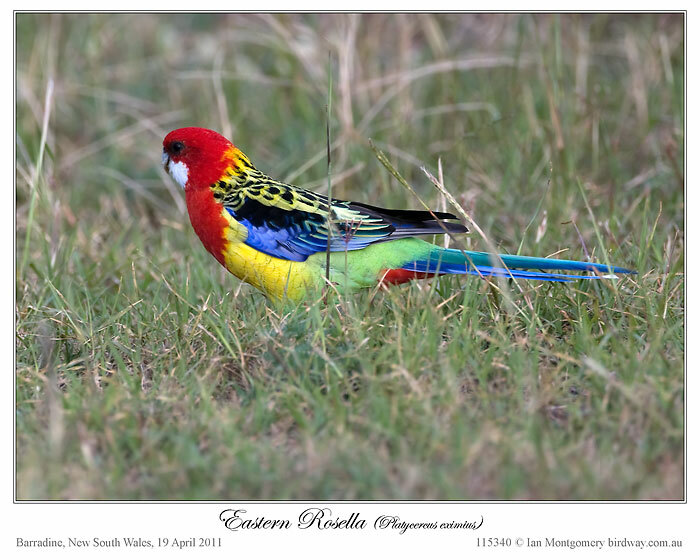 The Eastern Rosella is common within its relatively limited range comprising Victoria, Tasmania (where it is uncommon) most of New South Wales except the arid north-west, and extending into southeastern South Australia and southeastern Queensland. 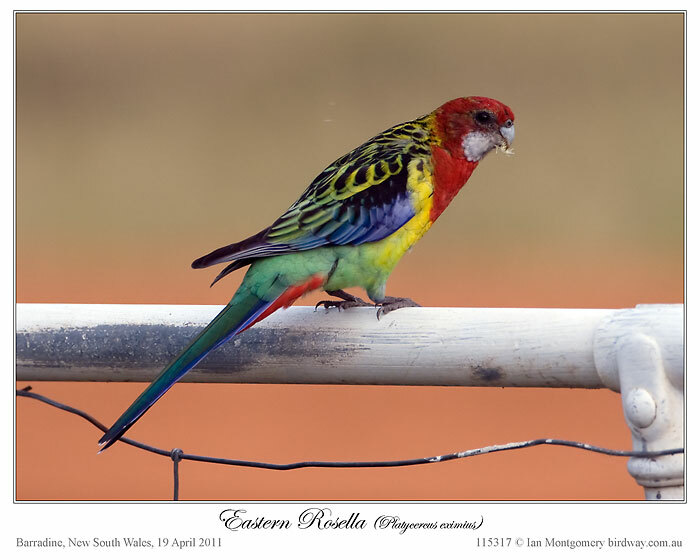 In the rest of coastal and central Queensland it is replaced by the closely related Pale-headed Rosella and the Northern Rosella, also a close relative, occurs in the Top End of the Northern Territory and northeastern Western Australia. Rosella taxonomy is confused and there is uncertainty whether these three, or at least the two eastern one, should be treated as a single species as there is some cross-breeding between Eastern and Pale-headed where their ranges overlap in northern New South Wales and southeastern Queensland. 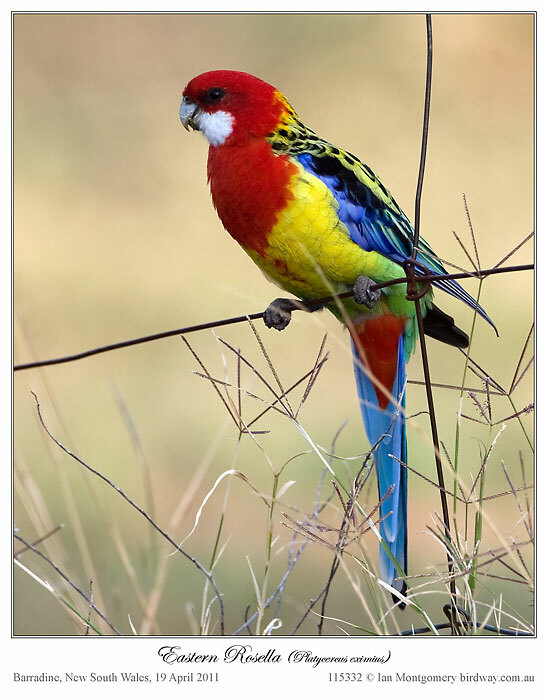 At present they are retained as three species but are sometimes collectively called the white-cheeked Rosellas as distinct from the blue-cheeked Rosellas comprising the Crimson, Yellow and Adelaide Rosellas which are now generally regarded as a single species. Wow! What a gorgeous bird of the Parrot – Psittacidae Family. Ian always seem to be in the right place at the right time to get many of his fantastic photos. This bird reminds me of the coat that was made for Joseph, a coat of many colors. I wonder if the maker of the coat had looked at a Rosella or some other of creations very colorful birds to decide which colors to use. This entry was posted in Bird of the Week and tagged Birds, Birdwatching, Ian Montgomery, Parrots, Photography, Psittacidae. Bookmark the permalink.